Home » art , drama , greensboro , musicals , sweeney todd , weaver academy » Go see SWEENEY TODD: THE DEMON BARBER OF FLEET STREET at Weaver Academy this week! 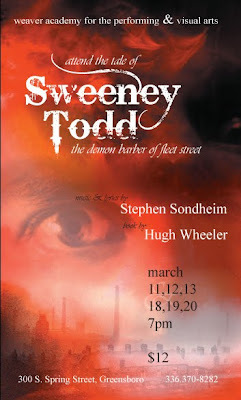 Go see SWEENEY TODD: THE DEMON BARBER OF FLEET STREET at Weaver Academy this week! If you're anywhere around Greensboro this next week, consider checking out Weaver Academy's production of Sweeney Todd: The Demon Barber of Fleet Street. I attended the performance tonight and it was riveting! It was definitely a show that was a cut above most that I have seen. In fact, I'm feeling hungry for more!